involved solution such as Java programming. computing. Java allows client-side programming via the applet and with Java Web Start. preventing the entire Internet from slowing down. 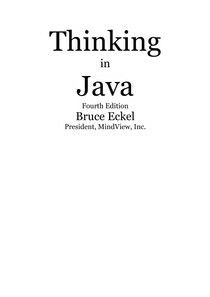 necessary to install the Java Runtime Environment (JRE) was too scary for the average user. its fate. In any event, Java applets didn\u2019t happen on a large scale. Nonetheless, applets and Java Web Start applications are still valuable in some situations. save considerable time, effort, and money, especially if you need to do frequent updates. improvements to Java in Java SE5. curve for new kinds of systems seems to be reduced.